foodnutzz...by nature & nurture! 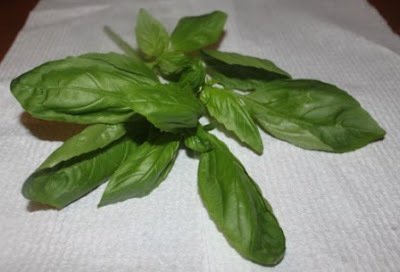 : when life gives you basil...make basil & almond pesto! when life gives you basil...make basil & almond pesto! While shopping for the everyday basics I couldn't walk pass the beautiful bunches of basil in my greengrocers. Leaves brilliant green, large and sooo aromatic. I just had to buy some. And what do you make when you have lots of fresh basil.....pesto of course! Traditionally pesto genovese is made pine nuts yet this time I thought I'd make a variation and try it with almonds. I also toast the nuts as it gives a wonderful nuttier flavour. Don't forget to cool them before you add to the rest of the ingredients, otherwise the heat will cook the basil and you'll loose that vibrant green colour in your pesto. Making pesto is so easy and has the most divine flavour....you'll never go back to a jar of pre-packaged stuff again. Place the basil, garlic, almonds in a food processor. Process until finely chopped. While the motor is running. gradually add the oil and process until combined. Add parmesan and process until just combined. Season to taste with salt. Spoon into a sterilised glass jar. Drizzle with olive oil to cover. Seal with lid and place in the fridge until ready to use. Cooks Note: As you use your pesto always cover it with a little more olive oil before returning back to the fridge to keep it from oxidising and allowing you to keep it for longer. As most olive oils aren't 'winterised' this means the oil solidifies in cold temperatures. You will find once your pesto has been in the fridge the oil on top will harden and go cloudy. There is nothing wrong with this. Just push it to the side a little and get your pesto from underneath. If you leave the pesto out at room temp you'll find it will become liquid again. Don't just save it to toss through hot cooked pasta - here's a few more ways to use it. spread it on toasted sourdough topped with a little ricotta and or avocado. mix it with a little lemon juice or white wine vinegar and olive oil as a salad dressing. mix it with a little sour cream and toss through warm potatoes for a hot potato salad. spread it over a pizza base then top with barbecued chicken, semi dried tomatoes and grated mozzarella. stir through hot cooked peas or broad beans as a side for steak. cook some thinly sliced mushrooms in a little oil, stir though pesto and cream and cook until heated then pour it over pan seared chicken breast. spread it over some cooked veal schnitzel, top with sliced cherry tomatoes and bocconcini and grill until golden. So tell me...... what do you do with pesto?